Agent 47 returns to a world filled with over-the-top violence, tight stealth mechanics, and a cavalcade of phallic references. During his long and, well, sanguine career, Agent 47 has killed a lot of people. This doesn't come as a huge shock for the protagonist of a series called Hitman, but even in the most stealthy of playthroughs, the elusive agent is going to shoot, strangle, garrote, slice, and bash his way through a variety of foes who, quite frankly, probably have it coming. While Agent 47 is not a good guy, he's generally killing folks even worse than he is. What happens, then, when the morally flexible assassin acquires a target who doesn't deserve to die? In Hitman: Absolution, the latest installment in the storied series, the powers that be task Agent 47 with the unenviable task of murdering his former handler, Diana. Over the course of a tense and gory stealth/action hybrid, Agent 47 will get to the bottom of the mystery surrounding this assignment, and take down a few gangsters, drug lords, and criminal masterminds along the way. Wasting no time capitalizing on the game's title, the preview begins with Agent 47 finding his way into a Catholic orphanage, disguised as a priest. He is out to find a girl named Victoria who holds valuable information, although further details will have to wait until the full game arrives. In order to show that both stealth and gunplay were viable options for this installment, IO Interactive ran through the demo twice with radically different approaches. The first run of the level involved slow, methodical, stealth-based gameplay, and made use of the game's many hiding spots, enemy routines, and distracting objects. In the stealth run, Agent 47 witnesses two armed, masked men gun down a nun and proceed into the orphanage. In order to evade the gunmen, Agent 47 must wait behind various pieces of cover, such as desks, cabinets, and closed doors, in addition to seeking out alternate, unpatrolled paths. If the titular hitman catches an enemy alone and unobserved, he can either put the gunman in a sleeper hold (which is quiet and nonlethal, but takes some time) or snap his neck (which is quick and easy, but can attract unwanted attention). 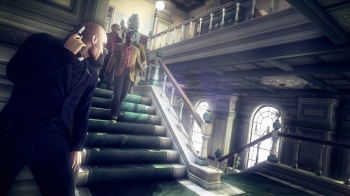 This play style is fairly merciless when it comes to detection: Agent 47 must hide dead or unconscious bodies right away, stay perfectly still behind cover when enemies are nearby, discover paths that take him the long way around hostile forces, and memorize adversaries' routes - probably through copious trial and error. During the course of the demo, Agent 47 winds his way through air ducts, around tight corners, and even evaded an entire room full of armed thugs through careful timing, judicious use of cover, and ambient noise that hid his own. One memorable sequence involves Agent 47 in a nursery making use of an obnoxious toy robot to mislead two goons while he effortlessly sneaks past. By the time Agent 47 finds his way to the final elevator leading him closer to Victoria, he has incapacitated several foes by nonlethal measures, but encountered neither detection nor fatality. Despite the fact that Hitman: Absolution can be a fairly grisly, gritty game, the color palette stretched beyond the grays, reds, and blacks that the promotional art may suggest. The orphanage level takes place in broad daylight, and looks like an actual home for children. Pinks, yellows, and blues festoon the bedspreads and toys. In the more ecclesiastic sections of the orphanage, Agent 47 wanders past rich rugs, statuary, and crucifixes decked out in green, silver, and gold. While both the protagonist and his enemies dress in drab, dull colors, this creates a fitting juxtaposition between the sedate environment and its bloodthirsty inhabitants. The second playthrough of the demo let stealth fall by the wayside and embraced the over-the-top violence and stylistic carnage that have been some of Hitman's hallmarks. Io Interactive has made Absolution equally amenable to this style of play, as Agent 47 picks up a fire ax and brains a foe not two rooms into the demo. Much as he previously used the toy robot as a distraction, Agent 47 can now pick up nearby objects to use as weapons - axes, fire extinguishers, or guns, if you're feeling especially mundane. The game is not a straight-up action title, but the gunplay in Absolution still offers something fairly unique. In addition to the old standards of running and gunning or firing from behind cover (which the AI will skillfully get around), Agent 47 can slow down time and "tag" foes. Unlike the bullet time from games like Max Payne or F.E.A.R., this mode does not simply change the speed of battle, but allows Agent 47 to line up multiple targets and choose a stylish way to eliminate them as soon as reality snaps back to normal speed. In the demo, Agent 47 painted a skull-and-crossbones on three foes' vital points: one in the head, one in the torso, and one unfortunate soul in the groin. As soon as time sped up, he executed them in a short cutscene before dealing with the rest of the enemies. The ability to shoot an enemy right in the pelvis is hardly a stretch from the rest of the game; in fact, based on the demo, Absolution has something of an unfortunate obsession with male genitalia. The dialogue - of which there is plenty, thanks to some extremely mouthy villains - can hardly go a single sentence without calling someone's manhood into question. While this writing choice is likely intended to amp up the game's realism, it serves instead to give the game an extremely juvenile, unpleasant script that makes the characters into hypermasculine caricatures. In spite of its questionable dialogue choices, Hitman: Absolution looks set to deliver a tense, thoughtful stealth experience with a story that should shake things up for longtime fans. The game is set for release at an unspecified time in 2012, which makes sense. After all, a target never knows just when or how Agent 47 will show up.